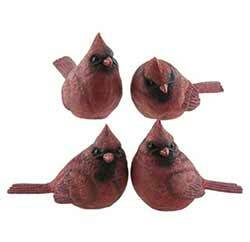 Bird Figurines - chickadees, finches, robins, cardinals, and all kind of songbirds for your decorating pleasure! Perfect for nature and gardening lovers, our resin birds are great for spring decorating, nature home accents, adorning indoor plants or bird's nests, etc. This is for the Chickadee. Perfect for nature and gardening lovers, our resin birds are great for spring decorating, nature home accents, adorning indoor plants or bird's nests, etc. This is for the Finch, in the large size. Perfect for nature and gardening lovers, our resin birds are great for spring decorating, nature home accents, adorning indoor plants or bird's nests, etc. This is for the Finch, in the small size. 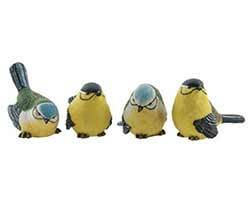 True-to-life bird figurines! Perfect for nature and gardening lovers. This is for the Washington State bird, the Gold Finch, in the small size. Great for spring home decor, accenting indoor plants or bird's nests, etc. 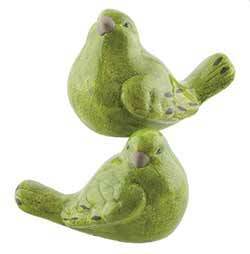 This set of two resin bird features come in a beautiful lime green color and a crackled finish. 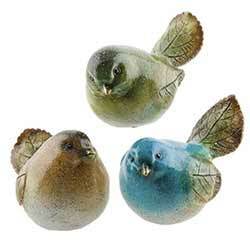 This set of three colorful resin bird features come in a set of three natural but colorful hues, with a speckled finish, and leaf wing and tail details. 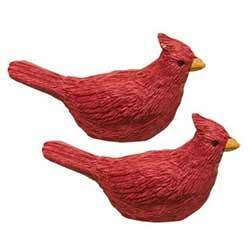 This is for a set of two mini sized red cardinals. Measure 1.25 inches tall, and 2 inches wide. 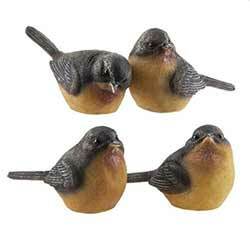 True-to-life bird figurines! Perfect for nature and gardening lovers. 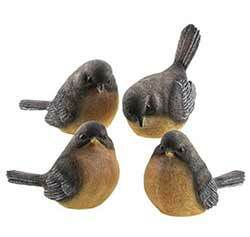 This is for the small Robin, measuring approx 2 inches high and 4 inches wide. Sold in a set of FOUR - one of each bird shown in the photo. Other birds available! Perfect for nature and gardening lovers, our resin birds are great for spring decorating, nature home accents, adorning indoor plants or bird's nests, etc. This is for the Robin, in the large size. 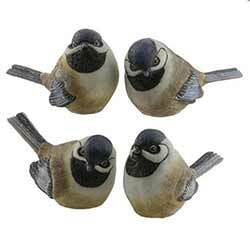 Perfect for nature and gardening lovers, our resin birds are great for spring decorating, nature home accents, adorning indoor plants or bird's nests, etc. This is for the Robin, in the small size. 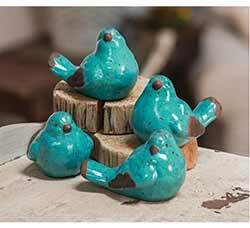 Colorful, yet beautiful when placed with neutral decor, this resin bird features bright blue finish with brown-painted speckles and feathers.